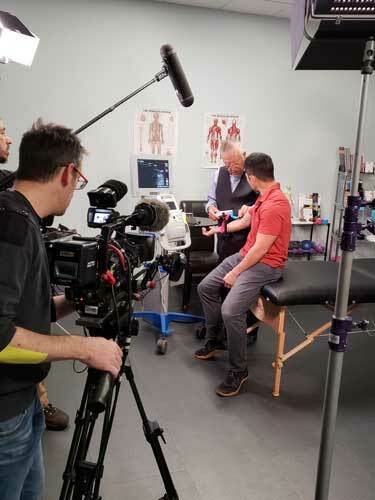 Did you miss the airing of Kinesio and Dr Kase on Henry Ford’s Innovation Nation? CBS “The Henry Ford’s Innovation Nation with Mo Rocca,” a national Emmy Award-winning television program showcasing the spirit of invention from historic scientific pioneers to today’s forward-looking visionaries, will feature Albuquerque-based Kinesio® and its Kinesio Taping Method® during its Saturday, April 6 show. Kinesio is the inventor and innovator of Kinesio Tape® and its taping method that is frequently used by Physical Therapists, Occupational Therapists, Chiropractors and Massage Therapists to name a few. The specially designed hypoallergenic tape alleviates discomfort and facilitates lymphatic drainage by microscopically lifting the patient’s skin. This lifting effect forms convolutions in the skin thus increasing interstitial space and allowing for a decrease in inflammation, reducing pressure while enabling a more effective flow of lymphatic fluid in and out of the target area. For active patients, Kinesio Tape is made of 100 percent lightweight, water-resistant cotton fiber and is easy to use and remove, especially on sensitive skin. It helps minimize muscular pain and soreness, while reducing swelling and inflammation. The use of the tape improves the healing process and works to prevent athletic injury. Complementing the tape, the therapeutic taping technique is designed to facilitate the body’s natural healing process while providing support and stability to muscles and joints without restricting the body’s range of motion. It also provides extended soft tissue manipulation to prolong the benefits of manual therapy administered within the clinical setting. health. My invention and the healing use of our tape are now considered the standard by which all elastic therapeutic tapes and techniques are compared.” Each episode of CBS “The Henry Ford’s Innovation Nation with Mo Rocca” tells the stories behind the world’s greatest inventions, along with the perseverance, passion, and price required to bring them to life. CBS “The Henry Ford’s Innovation Nation with Mo Rocca” is an education program that airs Saturday mornings on the CBS Television Network. For more information about Kinesio and the Kinesio Taping Method please visit KinesioTaping.com, call (888) 320-TAPE (8273), or email info@kinesiotaping.com. Kinesio® is a group of three organizations dedicated to the Kinesio Taping® Method: Kinesio University™, Kinesio Taping® Association International (KTAI) and Kinesio® Holding Corporation (KHC). Headquartered in Albuquerque, N.M., the collaboration of these three companies ensures representation for the Method across all realms of the therapeutic world. With more than 35 years of development, research and application, Kinesio stands apart in the field of elastic therapeutic taping. The collaboration of Kinesio University, KTAI and KHC provides an unrivalled combination of technical, research and educational service to practitioners, patients and users around the globe. This in conjunction with the company’s history provides the foundation for its current and future innovations, continuing to work together towards Kinesio’s vision: Tape the World for Health. A interesting article by our CKTP Dr. Sean Joseph. In the world of sports medicine, there’s a consensus on the therapeutic value of taping. I’ve been a Chiropractor since 2003 and can attest to its value. For the past six years, I’ve been a CKTP (Certified Kinesio Taping Practitioner) and have had the unique opportunity of helping athletes, from runners to basketball players, achieve a greater level of performance through the combined efforts of Chiropractic and taping. Using clinical experience to diagnose the primary source of pain, I can tape a patient to provide greater stability in ways that will “turn off the muscle by inhibition” or “turn on the muscle through facilitation ”. The factors of inhibiting and facilitating muscle aid in stabilizing the joint. Taping may be adapted to the exact outcome over time, as the objective is to learn how to stabilize a dysfunctional area temporarily (with the tape), then learn from the benefits of the taping to instruct patients on tailored corrective exercises (without the tape). So that’s how it works and why it’s offered at Integrated Chiropractic? But why Kinesio over other tapes? Kinesio Tex Gold is the preferred tape for CKTP’s. The outcome is better with tension and adhesion. There is a 10% stretch already given to Kinesio Tex Gold with the option to add additional tension to mimic the associate tissue. Additionally, this tape can be customized. As a CKTP I cut the strip to fit each patient. It’s essential then to understand the anatomy (insertion, origin and motion) of a patient and then prepare the skin for application. Each taping is unique and individualized – giving each taping (if cared for properly), 3-7 days of water-proof wear. Kinesio Tex Gold can be found in stores with the “classic” name on it. Kinesio Tex Gold comes in a handful of colors (Red/Pink, Blue, Black, Beige, White) however, the true value lies in the quality of the tape and the practitioner. Give us a call at 360-516-6296 to schedule. Our Certified Kinesio Taping Instructor (CKTI), Dr. Christina M Lujan, DC, AT, tapes one of her pregnant patients to help her feel more comfortable and more! It has been a very difficult past few months. The atrocities perpetrated against mankind are hard to comprehend. Kinesio has an international presence that is headquartered in Albuquerque, New Mexico. Even though we are far from some of the attacks, they hit home like they were happening in our own backyard. We wanted to reach out to our Kinesio Family around the globe and offer our sincere condolences for any losses you or your community may have suffered. It is important, however, that we do not lose sight of what Kinesio is all about and that is “Taping the World For Health”. Here at the Kinesio Taping Association International office we want physios and healthcare professionals in every country to get educated and certified in proper Kinesio Taping assessments and taping procedures. We have Certified Kinesio Taping Instructors teaching, mentoring students , writing and conducting research in dozens of countries worldwide. One of our newest offices is in Peru, where our expert Pilar Paris has already provided training for many medical professionals. We hope that she will continue this outreach. Although Pilar’s own practice is based in Bogota, Colombia, she has been gracious enough to help us out throughout her region of South America. If you would like to schedule a class or presentation with Pilar or with any of our other experts, contact us at pcallahan@kinesiotaping.com or dcole@kinesiotaping.com. 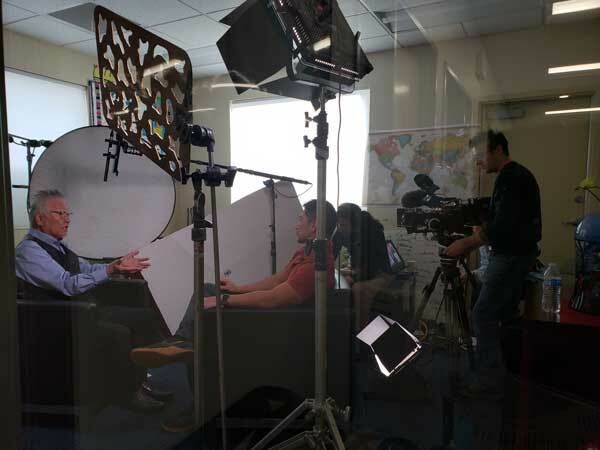 Kinesio’s founder and president, Dr. Kenzo Kase, was interviewed by Yasunori Takahaski of Cow Television. 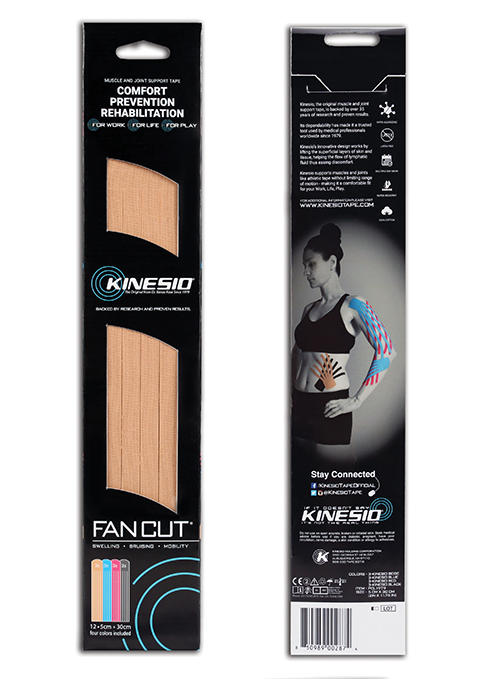 The Kinesio® FanCut® is back and now available through our distributor partners. The Kinesio® FanCut® provides your patients with the benefits of edema/inflammation taping and saves valuable time in the process. The Fan Cuts are made from the same Kinesio Tex you have grown to love since 1979. The Kinesio® FanCut® will assist in the removal of edema and inflammation by assisting fluid towards a less congested pathway and lymph node. So, whether you’re taping for circulation, lymphatic drainage, ankle/knee sprain or a bruised hamstring Kinesio Fan Cuts have got you covered. Kinesio is pleased to announce a new partnership with the Lymphology Association of North America (LANA). LANA provides the national certification examination for lymphedema therapists, to use the professional designation CLT. As a 2016 Premier Sponsor, Kinesio looks forward to collaborating with LANA on our shared mission to improve the quality of life for our patients and clients. PRINCETON, N.J. – Kinesio® Holding Corporation (KHC) is proud to announce that we are now part of the USRowing sponsor community. The Kinesio Taping® Method, developed by Dr. Kenzo Kase, is designed to facilitate the body’s natural healing process while allowing support and stability to muscles and joints without restricting the body’s range of motion. Kinesio® tape will be made available to USRowing Training Center athletes as they prepare for the 2016 Olympic Games in Rio. For more than 35 years, Kinesio® has been breaking ground in the fields of sports performance and certified health care specialists. Kinesio® is the original and most trusted tape of choice for the world’s elite athletes and the brand is firmly established as the global leader in elastic, therapeutic taping. The Kinesio Taping® Method is more than just slapping on a piece of tape. Knowing how and why to apply the tape is instrumental in an application’s success, and this is highlighted in the globally recognized education and certification program. Today, Kinesio University™ approved seminars and courses are offered in more than fifty countries across the globe. For more information, contact: Jeff Baskett, (888) 320-8273, jbaskett@kinesiotaping.com.